Author’s Note: The following is a mostly true story about a man and his sandwich. Anyone who has traveled in the Adirondacks knows that there are great places to eat. We have high-end restaurants, greasy spoons, diners, and almost every other type of eatery you can imagine. I know that I have my favorites. And on my short list of great establishments is one very unlikely place. What if I told you there was a place that makes a sandwich that is delicious, gigantic, and inexpensive? Would you believe me? Probably not. You’d probably think that I was joking, or crazy, or had bad taste in sandwiches, or thought that $10 for a sammie was cheap. Author’s Note: Let me assure you that none of those things are true about me. Well, I may be a little crazy and I’m usually joking. But not about sandwiches. That’s serious business! I, like you, was once a skeptic. I didn’t believe the stories. I denied the claims. I refused to heed the witness of others. And so, in my ignorance, I lived a life of darkness. There’s a good chance that many of you have not given as much thought to the science of sandwiches as I have. That’s ok. It probably means you’re normal, or have more important things to think about. Lucky for you, there are people like me out here, asking the big questions of life lunch. 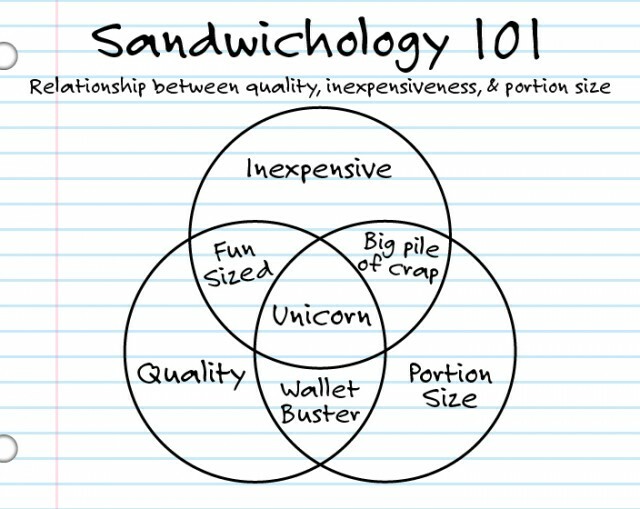 Basic Sandwichology has determined that there are three basic characteristics of all sandwiches: Quality, inexpensiveness, portion-size. Unfortunately, due to the laws of the universe, a sandwich can only occupy two out of the three characteristics. I’ve sketched up a diagram to help. I was in Wilmington getting my bike fixed/tuned up. The mechanic suggested that we get lunch. So I began to think to myself, but where? R.F. McDougalls? The Country Bear? Up A Creek? A&W? Wilderness Inn? (All of these are fantastic in their own right, by the way - when you come to Wilmington, come hungry!) The mechanic suggested grabbing a sandwich from Little Super. “Isn’t it just a grocery store?” My ignorance was clear to him at this point. So we made the short trip around the corner to The Little Supermarket. I will try to adequately explain the experience. The Little Supermarket is located on the main drag in Wilmington, just past the bridge over the River AuSable. As I approached the building, there was little to ease my scepticism. “Yup, I was right. It’s a grocery store,” I muttered to myself. The ordering process is easy and ingenious. Simply use one of the highlighters and select what you want. “What size should I get? Medium?” I asked. “I’d start with a small. I don’t think you’re ready for the medium yet.” I gave a brief thought to ordering the large, just to prove him wrong, but the thought of hearing “I told you so” changed my mind. I checked off the rest of my choices: roast beef, lettuce, tomato, onion, green peppers, black olives, peppers, mustard, mayo, salt & pepper, olive oil (if you can’t tell I really like sandwiches). I placed my order slip on the counter and it was immediately picked up by one of the ladies working behind it. “Oh, but I also got this drink and the chips,” I added. Certainly this could not be the total. But it was! I know, I know! I’m spending too much time chewing the scenery when all you really want is to know about the sandwich! The first thing you’ll notice about the sandwich is the heft. My “small” came in at over a pound. The Little Super does not skimp on the important stuff either. The meat was piled high and the toppings were plentiful. The veggies are crisp and tasty. This is a top notch sammie! The only downside of the sandwich is that my mouth was barely big enough to take the first bite! By taste alone this sandwich is in my top 5 (Standard Sandwich Category). But when you factor in its size and value, this is a certified unicorn! Good aT Sandwich Making...Bad at Math? So what gives? How does a sandwich on this side of Heaven achieve unicorn status? We may never know. But I believe that mysteries are the spice of life and instead of stressing over the paradox, the next time you head to Wilmington for a little biking - skiing - hiking action, order a Little Super Sandwich for yourself!